Empower students to graduate sooner with fewer credits while stretching student support staff to cover more students. Educational Positioning System (EPS) is an emerging new platform for higher education. This tech solution is being developed to cover the entire student lifecycle including college readiness, student engagement, on-time graduation, and career placement. 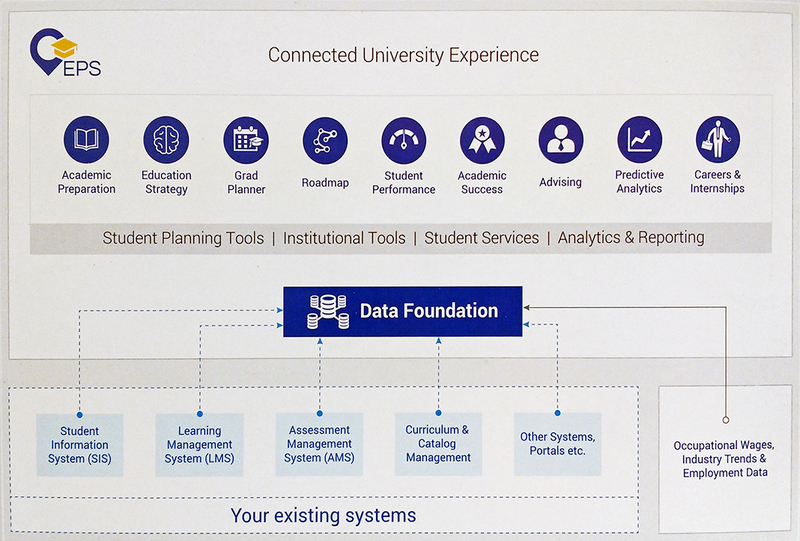 Through the integration of nine modules while leveraging data inputs from your institution’s SIS and LMS, the EPS platform can dramatically improve the quality of the student experience. Additionally, EPS is a suite of self-help tools that enables your students to take care of many of their needs without direct staff support. An adaptive learning tool that provides self-assessment and on-demand coursework to bring up an individual student’s abilities in mathematics, reading, writing, and studying to college-ready levels. Guides students through a self-assessment of interests and skills to identify potential careers paths linked to the latest labor market databases while presenting a variety of options for supporting majors. Provides students with an optimized plan for their selected major which allows for customization and real-time assessment of alternative courses along with evaluation of the opportunity cost and impact of any major changes. A unique tool that allows academic and non-academic milestones to be set and tracked to provide students with a valuable process of development to prepare them for their chosen career or for additional schooling. A data repository that tracks student outcomes linked to program, department, and institutional indicators while measuring progress on key competencies for their selected career. An adaptive tool that guides students that are struggling to on-demand supplementary learning courses and quizzes as needed while connecting students with the opportunity for live tutoring sessions. Facilitates the meetings of students and advisors while keeping track of the advising sessions to enable consistent and well-informed interactions with the students. A comprehensive tool that tracks customizable student performance indicators to provide live feedback to students and staff to take actions that provide for timely intervention. A dynamic tool that connects students with job opportunities and internships that align with their chosen career path along with providing a platform for employers to schedules events and interviews with students. Developed by higher ed for higher ed. Built in close collaboration with Brigham Young University-Idaho, EPS was influenced from the ground up as a tool that will bring returns to the institution and valuable benefits to the students. Reduce your institution’s remedial course load. The Academic Preparation module can bring students up to speed before embarking on their first semester. Additionally supplementary materials through the Academic Success module are available in real-time to enhance the opportunity for student success as they tackle major specific coursework. Reduce your institution’s attrition rate and increase the graduation rate. By providing students with a clear and simple tool to set their path with the Educational Strategy module, EPS helps students to create a purpose, a plan, and real-time updates to encourage their goals for success. The Roadmap module guides them on a path to prepare the necessary skills and to develop a network that will increase their chances for the next steps after graduation. Students become actively involved in making decisions rather than just having answers given to them. Reduce the time to graduation and the average credit load at graduation. The powerful combination of the Educational Strategy, Grad Planner, Roadmap, and Alert modules take students through an on-going plan that unfolds, adapts, and supports their academic journey. The Academic Success and Advising modules provide the needed resources to reduce course re-takes and add-value to the vital student support services that keep students on track. Enhance the future opportunities for your institution’s graduates. The Roadmap module tracks a student’s emerging professional develop while the Student Performance module tracks their academic progress on core competencies and skills that are matched to their career of choice. This growth is captured as student connect with future employers on the Career and Internships module. 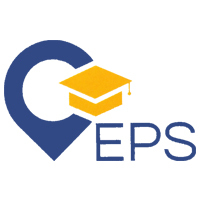 The EPS software is designed to welcome students as they arrive to campus and stays with them throughout all of the academic and career choices that they will need to make. Platform architecture and data design. Stay connected to find out about product development, beta opportunities, and product launch. Educational Positioning System (EPS) is a product by Excelsoft Technologies, Inc. developed in partnership with Brigham Young University-Idaho. Excelsoft is a provider of innovative technology-based solutions in the education and training space. Incorporated in the year 2000, Excelsoft designs E-learning solutions based on a pedagogical approach towards content design and technology implementations with operations in India, Malaysia, Singapore, UK, and the USA. This website is furnished as a service as a part of market research for Excelsoft by the Research and Business Development Center (RBDC). The RBDC is committed to providing applied learning opportunities for undergraduate students in the agriculture, business, and computer tech disciplines. The RBDC is a 501 (c) 3 non-profit with a mission focused on education and research. Click here to learn more. © 2016 Excelsoft Technologies, Inc.